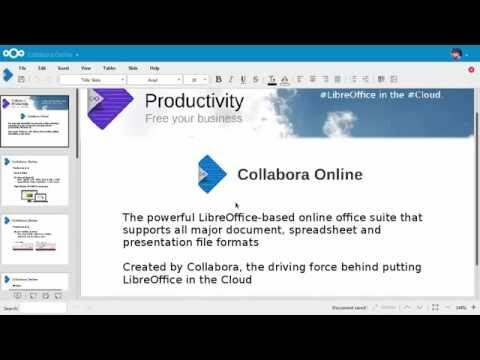 Thanks to a partnership of Nextcloud with Collabora there is now a great solution for self hosting Online Office for everybody! Nextcloud, being a strongly community-focused project, worked with Collabora to provide a easy to use Online Office solution for the first time for home users, easily integrated in Nextcloud. At the same time, we announce availability of offerings for our enterprise customers, who get access to a secure, easy to use and well integrated Online Office solution in their Nextcloud installation. Bringing an integrated open source document suite into Nextcloud with support for important file formats users need to work with every day has been a key goal for us since we started our project. As we care about all our users including contributors, home users and small and large enterprises, we wanted to make sure there was a solution for a wide range of use cases. The result of our cooperation with Collabora is that, from now on, Nextcloud users have access to a free, easy to use and regularly updated LibreOffice Online docker image which you can find here. The Online Office feature provided by this docker image is easy to integrate in Nextcloud following the instructions on this page. Collabora and Nextcloud are committed to providing regular updates of this image so users, benefiting from the easy upgrade process available in docker, have an up to date Online Office! At the same time, enterprise customers can now purchase support contracts for a scalable and more secure solution from Collabora and Nextcloud. Our in depth expertise and security knowledge will ensure reliable deployments even in the most demanding circumstances. Collabora Online integrates in Nextcloud, providing users with the ability to share a document with multiple users who can see changes in real time, avoiding conflicts or versioning issues. Build in secure chat and WebRTC video conferencing in Nextcloud complement the experience, allowing a new level of collaboration and productivity. You can get the docker images from the Collabora website and follow our documentation to integrate it into your Nextcloud. Share your feedback so we can work together to make this an even better product! If you’d like to discuss these things in person, meet us and the Collabora developers at the Nextcloud Conference, sept 16-22 in Berlin. Customers are invited to explore the capabilities of Nextcloud and contact us for a quote. Even though docker might be the easier solution for most people, I’d apreciate it if you could provide (not distribution specifc) source packages along with an explanation on how to set all required services up manually. I’m anxious to try the Collabora online office integrated in my owncloud setup (which will be migrated to Nextcloud shortly) but having to set up docker simply does not fit into my current setup. Besides that, I rather install software myself and configure the components manually to get a solid understanding of how they work together and what is necessary to make them work. Yes, please provide a Docker-free solution. It was the most logical choice for home users but unfortunately it is not exploitable for everybody, I myself can’t run Docker as I have a 32bit hardware. If instructions on how to setup a Collabora server to get it runing with Nextcloud app would be provided, would be awesome, because restraining such a feature with such a big requirement isn’t, I believe, the best way to go. Another vote for a Docker-free integration option. Even if it takes more work to install and configure, I’d much rather deal with a traditional installation. Would be awesome when it is possible to install Collabora without docker. I use an Vserver with Openvz. It’s not possible to install docker on it. I’d rather follow a tutorial who explain how to get the last source, how to compile and how to configure it with nextcloud/owncloud. For example for spreed.me there is some help how to make it work. Any plans when a dockerless version of collabora will be available which does not require a docker host?